Phosphoric acid can be very hazardous in the case of skin contact, eye contact, and ingestion. It can also cause irritation if vapors are inhaled. This chemical can cause damage to the skin, eyes, mouth, and respiratory tract. Because of the potential hazards posed by this chemical, it is important to use care when handling it. Repeated or prolonged exposure to phosphoric acid mist can lead to chronic eye irritation, severe skin irritation, or prolonged respiratory tract issues. To protect your health when handling this potentially hazardous chemical, it is important to use caution in the form of personal protective equipment (PPE). Inhalation—Seek fresh air and immediate medical attention. Eye Contact—Remove contact lenses if present. Immediately flush eyes with plenty of water for at least 15 minutes, and get medical attention. Skin Contact—Wash skin with soap and water. Cover any irritated skin with an emollient. Seek medical attention. Ingestion—Do NOT induce vomiting. Never give anything by mouth to an unconscious person. Seek medical attention if any adverse health symptoms occur. 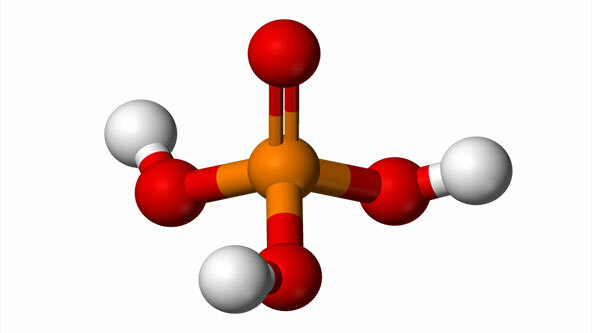 Store phosphoric acid in a cool, well-ventilated area protected from moisture. Keep away from incompatible substances such as oxidizing agents, metals, combustible materials, and alkalis. This chemical should be stored in a metallic or coated fiberboard container using a strong polyethylene inner package. Dispose of this chemical in accordance with federal, state, and local environmental control regulations. Need more safety information about phosphoric acid or other chemicals in your workplace? Check out our extensive library of MSDS information here.